The engine builder’s or manufacturer’s break-in recommendations should be followed if available. Break-in period should not exceed 1,000 miles. When the rings fail to seat, the exhaust ports will have a large area of oil residue (Fig. 3). As the rings begin this process, less oil is passed and the oil residue area begins to shrink (Fig. 4). When the rings are fully seated and have formed a tight seal against the cylinder walls, no oil residue will be evident. 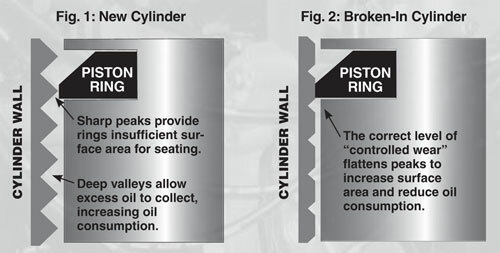 Other common methods to determine if rings have seated include performing a leak-down test or horsepower measurements over time. Break-in duration will vary between engines. Afterwards, drain and fill the engine with an AMSOIL high-performance synthetic oil that meets builder or manufacturer specifications.